As much as we like to think we’re invincible, we’re not. Since the car was first invented, advancements in technology and updated standards have made them increasingly safer. But even with greater precautions, the frail human body often can’t survive a crash. But what if our bodies were to change to cope with the impact of a car accident? 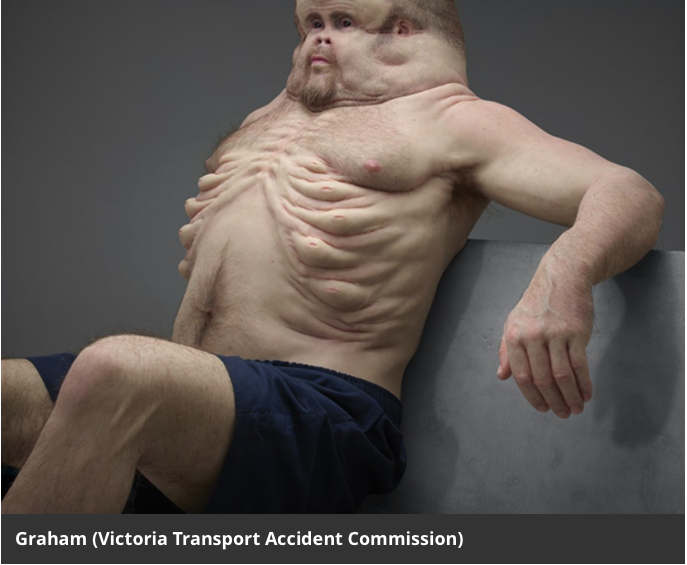 Recently, the Transport Accident Commission of Victoria, Australia commissioned a sculpture based on what a human who has naturally evolved to survive a car crash might look like. Nicknamed “Graham,” the sculpture was designed by Melbourne-based artist Patricia Piccinini. With help from Christian Kenfield, a trauma surgeon at Royal Melbourne hospital, and David Logan, a crash investigator at Monash University’s accident research center, the group set out to design a human who had evolved the defenses necessary to survive a high-speed collision, Elle Hunt reports for The Guardian. Seatbelts and airbags might lower the risk of serious injury in a car crash, but that doesn’t mean much for fragile, fleshy people when they are struck by a speeding car. So to design a human who may have evolved to survive a car crash, the collaborators had to take physics and biology into account. And it all starts with the head. This entry was posted in Science and tagged Anthropology, Art, Biology, Science. Bookmark the permalink.